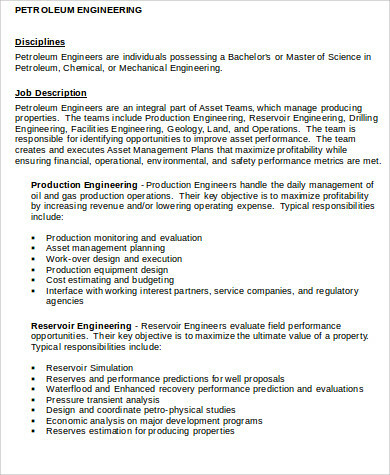 Do you want to be a petroleum engineer? 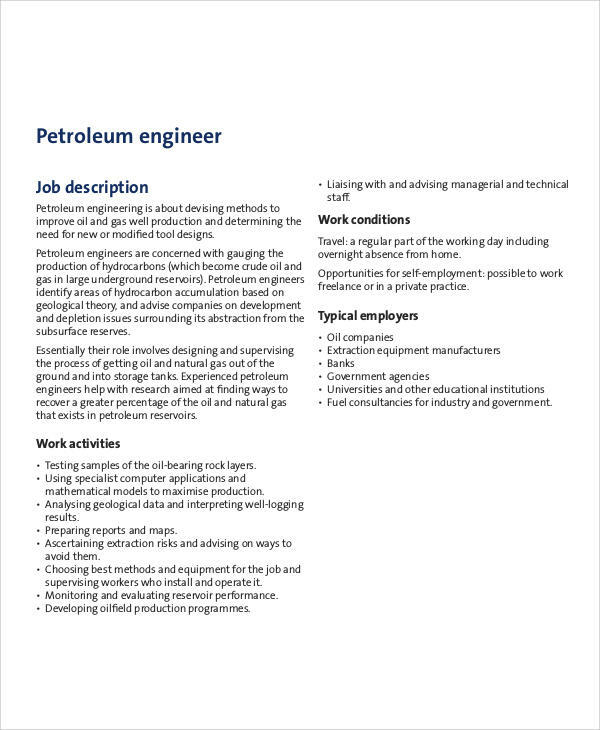 Do you know what petroleum engineers do? According to the University of New South Wales, gas or oil companies would employ petroleum engineers to test, design, as well as implement efficient methods for extracting petroleum products from the sea floor and from the earth. For petroleum engineers, most of their time are spent on calculating and making estimations since they do not know what is actually going on thousands of meters below the ground. Perhaps you might want to have a look and browse through these Job Description Samples, which you may find useful as well as significantly relevant. 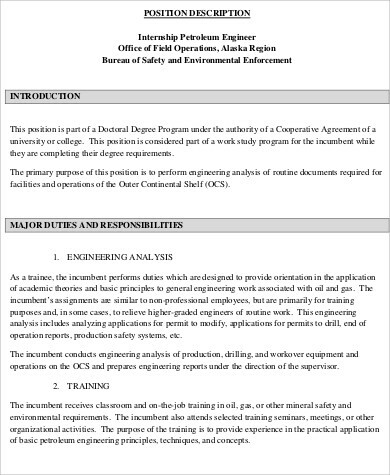 You can also check out this page’s Civil Engineer Job Description Samples that you may find helpful as well as useful in gathering general key information as well as details that is absolutely relevant to the subject matter, which in this case is the description of the petroleum engineer career position and all that there is to know about it. 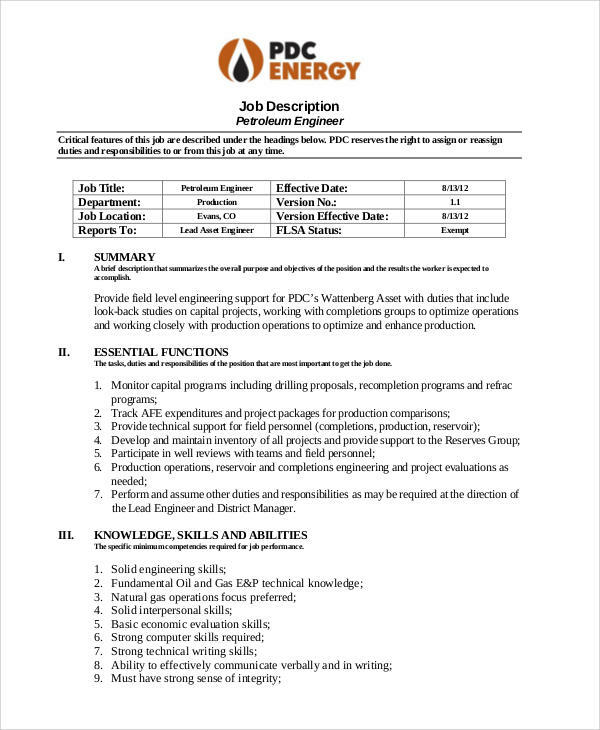 Drilling Engineers – this type of petroleum engineer determines the best most efficient way to be able to drill and oil or a gas well, also considering the costs as well as the expenses of the particular project. They should also make sure that the process of the drilling is safe, minimally disruptive, as well as efficient to the environment. Completions Engineers – according to Truity, this particular type of petroleum engineer would decide the excellent way to finish or complete building a well so that the gas or oil will be able to flow up from underground. 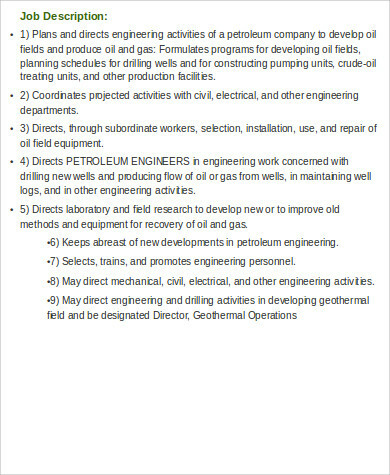 They would also monitor as well as oversee the work that is ready for production as it may include the use of tubing, pressure control techniques, as well as hydraulic fracturing. 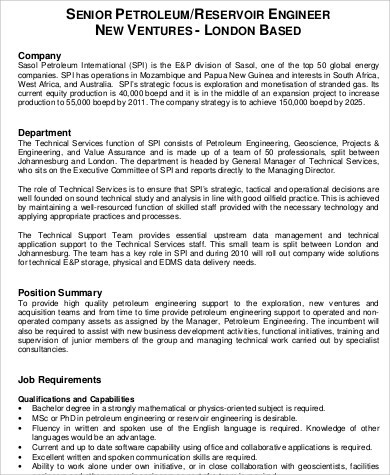 Production Engineers – this particular type of petroleum engineer would take over after a well has been already completed. Basically, according to Truity, they would figure out ways on how to increase the amount of the extraction on which the gas or oil production has been producing. They also monitor as well as oversee the overall production. Reservoir Engineers – this particular type of petroleum engineer would calculate as well as estimate the amount of gas or oil that can be recovered from the underground, which is also called reservoirs. According to Truity, they would study the reservoir’s characteristics to be able to determine which appropriate method to use to be able to get more gas or oil out of the reservoir. 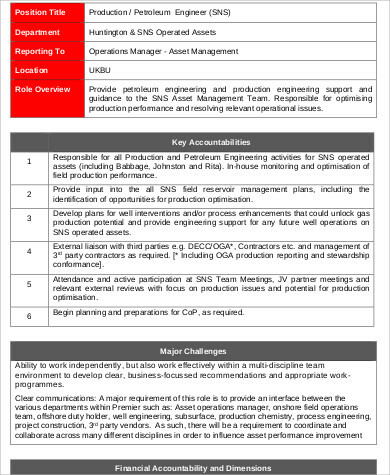 You can also take a close at Process Engineer Job Description Samples to be able to get a more specific insight.